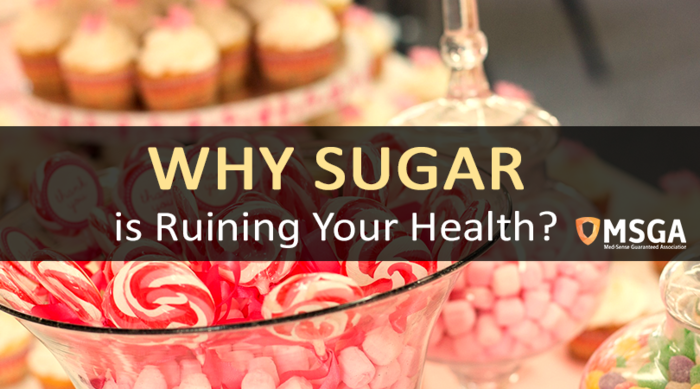 A high sugar diet has any negative impacts on your body and mind. Nowadays, a lot of food that is readily available is also loaded with a lot of added sugar. Knowing what sugar does to your body can help you become more vigilant about where sugar lurks and how to avoid it. Here are some reasons why sugar is ruining your health. The worst thing about a sugar craving is that the satisfaction is only temporary. Once satisfied, it is only a matter of a few hours before the cravings and hunger start again. People who have a high sugar intake often experience cravings for more sugar along with mood swings, headaches, and fatigue. When you consume a lot of sugar, some of it attaches to proteins. This process is called glycation. What this does is it contributes to loss of elasticity in body tissues including your organs, arteries, and skin. Your dentist and toothpaste commercials will say this often – sugar causes tooth decay. Sugar can cause decay in your teeth more than any other substance can. The longer sugar sits in your teeth, the more damage it can cause. High sugar consumption causes resistance to insulin, a hormone that regulates blood sugar levels. Resistance to insulin causes an increase in your blood sugar levels and puts you in a greater risk for diabetes. A high sugar diet is also a cause of obesity which is one of the leading risk factors for diabetes. Obesity rates are increasing all over the world thanks to added sugar. One of the main culprits being sweetened beverages such as sodas, juices, and sweet teas. All of these drinks are loaded with fructose which causes a resistance to leptin. The function of the hormone leptin in your body is to tell you when you are full. As a result, you are likely to eat more and gain weight. Evidence shows that high-sugar diets can lead to an increase in blood sugar levels, high blood pressure, high triglyceride, obesity, and inflammation. All of these are risk factors for developing heart disease. Additionally, high sugar consumption is also linked to atherosclerosis, a disease wherein arteries are clogged by fatty deposits. Refined carbs such as sugary food and drinks can rapidly increase blood sugar and insulin levels. When this happens, androgen secretion, oil production, and inflammation spikes. These are the contributing factors to acne development. Conversely, population studies conducted in rural areas where non-processed foods are consumed show low to non-existent rates of acne. Be mindful of limiting the amount of sugar that you consume. Following a healthy diet that consists of healthy, unprocessed whole foods is the easiest way to avoid added sugar. A low sugar diet combined with other healthy habits will help you avoid these negative effects.